Hardware stores certainly have their place for those do-it yourself folks, I get it, I am a do-it yourselfer too – but just because it is sold at the hardware store doesn’t mean you should use it or that it is even up to plumbing code. One of the most common handyman or do-it yourself repairs that we find gets caught on home inspections is out of code drain lines. 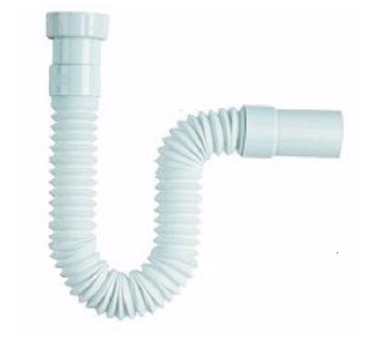 This corrugated pictured here is sold at all of the major hardware stores and in theory can seem like a great idea for homeowners and handymen to use to repair drain lines under kitchen and bathroom sinks, guess what? This drain line is out of code, and for good reason. While the installation of the drain line makes it easier for the person looking to not have to worry about measuring and cutting and getting everything connected just right – this drain hose is sure to cause you issues in the future. All of those crevices are bad news. Those crevices are storage areas for all the nasty stuff that goes down your drain and it isn’t long before that pungent odor fills the room and you can’t quite determine where it is coming from or what it is. This corrugated drain line is also a common factor in stoppages, without smooth sides for debris and water to smoothly discharge into your plumbing branch line stoppages are a frequent and costly occurrence with these types of drain pipes. I can’t say why hardware stores sell items that are out of code or that will only create more problems in the future, but they do. Don’t be tempted to use this corrugated drain line in your home, you will only be forced to do the project twice which in the long run will cost you more money than having a professional plumber do it right the first time.